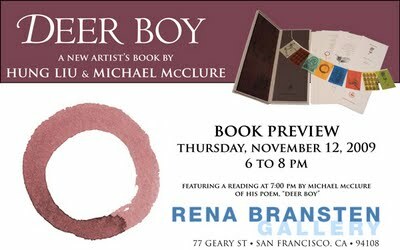 On Thursday, Nov. 12, 2009 from 6 to 8 pm, Rena Bransten Gallery will host a special book preview for Deer Boy, a new artist's book by Hung Liu & Michael McClure, published by Magnolia Editions. The event will feature a reading at 7 pm by Michael McClure of his poem, "Deer Boy," composed especially for this publication. Please don't miss the chance to encounter this handsome book, to meet the artists behind the project, and to hear a Bay Area literary icon read one of his most evocative works. 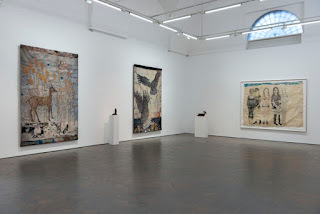 Rena Bransten Gallery is located at 77 Geary St in San Francisco (click for map). For more information about the book, you can also check out Magnolia's press release.